These hearty pancakes are tasty and stick to your ribs. 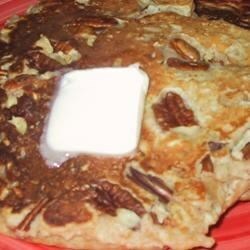 The pumpkin and pecan work well together and the vanilla extract adds a great flavor. They taste sweet and rich, but don’t have much sugar or fat. In a bowl, combine whole wheat pastry flour, multigrain hot cereal, and baking powder. In a second bowl, beat eggs and combine with milk, pumpkin, yogurt, vanilla extract, sugar and salt. Add wet ingredients to dry, being careful not to overmix the batter. Fold in pecans.